Drinking wine while lying in bed, flat on your back is messy and stains the sheets. And to make things worse, laughing about it just hurts. Poor boy, He’s been laid out all week with back pain. Unfortunately, His spine isn’t the only thing suffering: so has our wine-blogging. There has been some drinking (of course), but after a few disastrous attempts at sipping wine and note-taking in bed, for Him it has since consisted of grimacing through shots of Jamesons in hopes of some pain relief. I’ve been playing nurse as best as I can (and I really do hate to see Him suffer), but the truth is when I have a cute boy lying naked in my bed, feeding him soup and holding His hand isn’t really what I want to do. This afternoon I got out of the house and took a walk around the neighborhood. Somehow I found myself at Pla Boy Liquor. Somehow. Okay, I was in the mood for a stiff…drink. 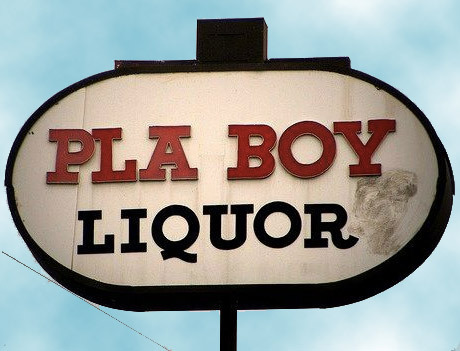 Actually, We’ve been talking about making Pla Boy the new Big Mac’s: wherein We buy wine from a (very unfancy) local liquor store in one of our neighborhoods. Big Mac’s Mondays was a super fun feature for Us on the blog, but since I’ve moved away from Silver Lake I haven’t found an equivalently scuzzy-yet-great corner liquor store near my new Hollywood digs. Shocking, but there aren’t a lot of liquor stores in the ‘hood. Pla Boy is a candidate. First of all: the name. The puns seem deliciously endless (soft core neighborhood liquor store) and they actually have a pretty extensive wine selection (as well as malt liquor and canned cheese products). And I dig the Victorian flocked red velvet wallpaper (which is slowly peeling from the store’s walls). But there are some draw backs, like I wouldn’t go there after dark. Or maybe even at twilight. Despite the bullet proof glass and the barbed razor wire around the parking lot, I get the opposite feeling of safety. But this afternoon, in the bright Hollywood sunshine, Pla Boy seemed perfectly cheery and cheesy and just what I needed: boozy. I picked up a split of vodka and two bottles of cleverly-labeled wine. I decided that today would not be a big thinking, thoughtful slurping wine drinking kind of day, but rather a “I’ll buy this wine because it’s cheap and has clever packaging” kind day. And the vodka purchase was just because I really wanted a drink. 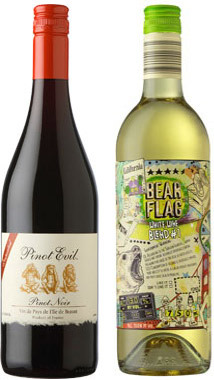 Back home, I’m sipping a V&T and looking at these two wines: White Wine Blend #1, Bear Flag, NV ($8.99) and Pinot Evil, Pinot Noir, vin de Pays de l’ile de Beauté, NV ($8.99). I may rouse Him from my bed and get Him to taste with me. Or I may just have a few slurps alone.